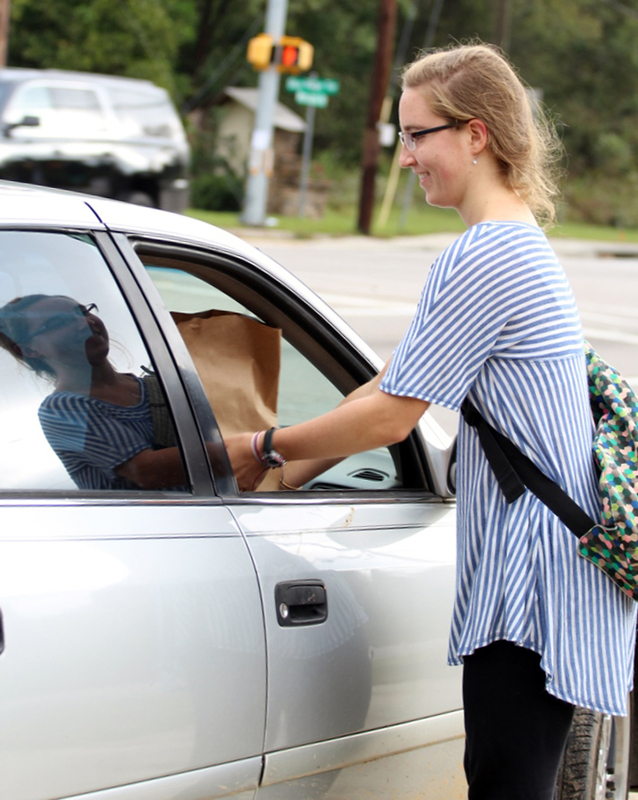 CIU student Katie Mayberry provides curbside service as SMC ministered to the needy along the Monticello Road corridor. This was the response of a Monticello Road resident who received one of 266 bags of groceries from CIU’s Student Mission Connection (SMC) as the group reached out to the local community. SMC set up a tent, table and a sign that said “free groceries” just down Monticello Road from CIU on property recently purchased by the university. SMC President Jacob Lester said the goal was to love the community and show Christ through meeting a physical need. “It’s not about CIU or SMC. It’s about Christ,” added SMC Vice President Emily Reims. Volunteers and members of the SMC team beamed as they connected with people who stopped and got a bag of food. In addition to receiving a bag of groceries and a New Testament, grocery recipients also had an offer for prayer. SMC’s leadership hopes to partner with local churches in future ministry such as a prayer tent and a prayer walk. Among those on hand for the event was CIU President Dr. Mark Smith who was thrilled to see the students so involved in the community. The SMC team was encouraged to see Smith’s support and encouraged by the 1,000 canned goods CIU students and faculty donated to make the event a success.